Brian Cookson won today’s election 24-18 in Florence. 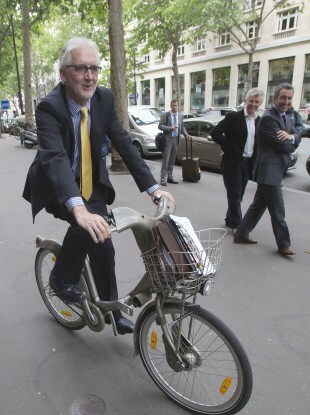 Brian Cookson poses for photographs after a press conference in Paris. PAT MCQUAID’S EIGHT-YEAR stint as president of cycling’s governing body, the UCI, is over after today’s election in Florence. Brian Cookson, the president of British Cycling since 1996, took the presidency with 24 votes to McQuaid’s 18 from the 42 voting delegates. It capped a long and frustrating day in Florence’s Palazio Vecchio where McQuaid, in power since 2005, had initially failed to gain nomination but forced his way through by relying on loopholes in the UCI constitution. As the election descended into near farce, with many voting delegates taking the floor to criticise a process that threatened to drag on even further, Cookson grew frustrated and called McQuaid’s bluff. “Alright, we’ve had enough of this. I’m going to propose that we pass straight to the election,” said the Englishman. Less than 30 minutes later the result which ended McQuaid’s bid for a third mandate was delivered. Loud applause erupted and a triumphant Cookson said: “It is a huge honour to have been elected president of the UCI by my peers and I would like to thank them for the trust they have placed in me today. “The campaign to get to this point has been intense but I am under no illusion that the real work starts now. “So I call on the global cycling community to unite and come together to help ensure that our great sport realises its enormous potential. This is the vision that will drive and focus my activities over the next four years. “I have said throughout my campaign that we must embrace a new style of governance and a collegiate way of working so that a new era of growth and commercial success for the UCI and our sport can begin. In keeping with the rhythm of the day’s events, McQuaid continued the congress as if nothing had happened. Email “McQuaid defeated in UCI presidential vote”. Feedback on “McQuaid defeated in UCI presidential vote”.